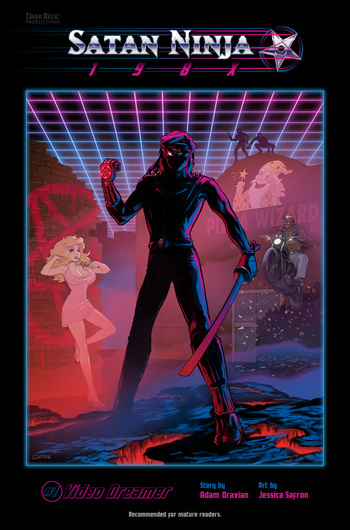 Satan Ninja 198X is a long-form webcomic created by Adam Dravian (writer) and Jessica Safron (artist, writer). It's an action-comedy that draws influence from all sorts of 1980s media, especially B-movies. The story follows a high school dweeb in the '80s whose life gets radically altered when he accidentally acquires an ancient ninja gauntlet, which gives the wearer the powers of a Satan Ninja. It's important to note that the Satan Ninja isn't evil. He's just bad. The webcomic is available for free at satanninja.com. It might be rated R for "Too RAD For Work," but be warned, it is recommended for mature readers only. '80s Hair: Many of the female characters sport a complete Aqua Net package in all it's glory. Some rad mullets for some of the males as well. Ninja: The dorky main character finds a magic glove that turns him into a ninja with infernal powers. Also there's a clan of satanic ninjas that dwell in the sewers.